The first attempt at based on 2000AD comic’s Judge Dredd with Sylvester Stallone was a predictable science fiction feature that missed the mark by quite a lot so I was interested when heard they were giving it another go and the film got some pretty good word of mouth. I didn’t manage to catch it at the cinema so I had to wait for the Bluray. This film is dark, brutal and packed with tension and it has strong performance from Karl Urban as Dredd, played with a calm ruthlessness that is totally different from the shallow shouty Sylvester Stallone attempt. After a short voiceover set-up and a flyover of Mega City One we get an introduction to Dredd (Karl Urban) in action taking down three fleeing crooks. He gets called back to headquarters and one of his superiors introduces him to rookie Judge Anderson (Olivia Thirlby) who just failed her basic training. Despite that the senior judge wants to give her a chance of a field test because she’s a mutant with psychic powers that might be useful in fighting the powerful criminal gangs and she asks Dredd to take her out and assess her. The big bad that Dredd faces is the smart and very dangerous Ma-Ma (Lena Headey) the leader of a gang based in one of the enormous slum housing blocks called Peach Tree. She controls the supply of a brand new drug called Slo Mo that lets users experience time as if has been slowed by a factor of 100 and leads to some really beautifully filmed scenes of carnage. It is her punishment execution of three Peach Tree residents that brings her activities to the attention of Dredd. Dredd and Anderson arrive at Peach Tree and start their investigation into the deaths. The local paramedic TJ at the medical centre updates Dredd on the situation in the block and we learn the story of Ma-Ma’s rise in power and how her gang run the whole block. TJ tell them the location of an apartment they are using to sell drug on the 39th floor so Dredd and Anderson raid the place. This raid is shot is the glistening slo-mo style and once it’s over anyone who pulled a gun on Dredd and Anderson is dead and the cuff the rest for arrest. While Anderson is cuffing one man called Kay she reads his mind and knows that he is the one who killed the men. If Dredd has any doubts about his guilt he cannot execute him on the spot so because Anderson will only commit to 99% certainty they have to take him in for interrogation. This decision really does not sit well with Ma-Ma who would prefer that Kay not be taken in for questioning so she has the entire block sealed up and announces a bounty on the heads of the two judges. Cut off from any outside help Dredd and Anderson have to make their way through the block while Ma-Ma throws everything she’s got into stopping them leaving alive with Kay. 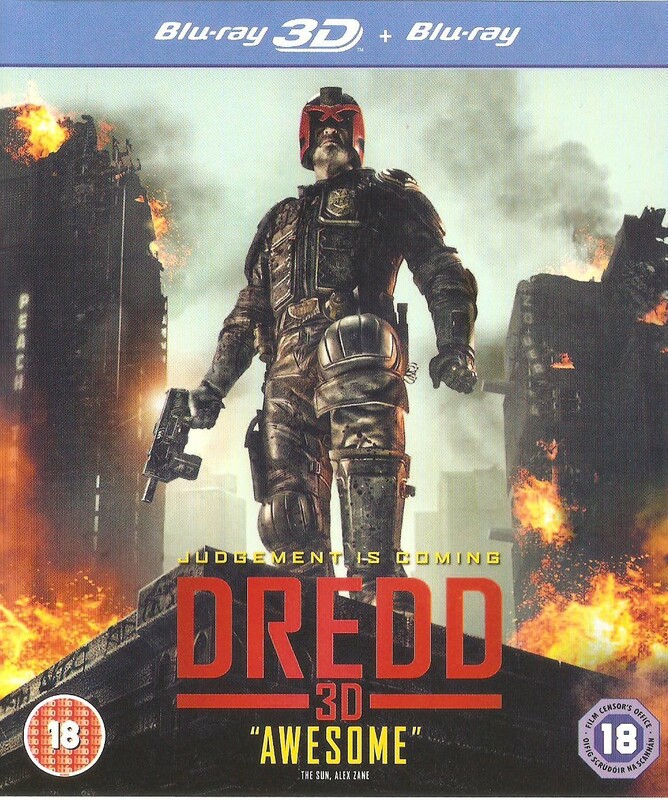 An over-the-top character like Judge Dredd really needs a desperate world for him to represent justice and the great thing about this film is it really does create the world in which a character like him is justified. The future is just like the present only bigger and suckier and the value of human life is well represented by the fact that dead bodies are cleaned up by protein recycling robots. Karl Urban is great as Dredd and still manages plenty of expression with most of his face concealed beneath the helmet. His voice is always steady and even officious as he passes judgement and sentence. Olivia Thirlby really does good job as the rookie judge coming to terms with job of a judge. Lena Headey plays Ma-Ma almost as a criminal version of Dredd, cold emotionless and brutal. I highly recommend this film to fans of violent action films and especially to fans of Judge Dredd and if I’d seen this film in the cinema last year I would have had it in my top ten. Good review. It’s fun, bloody, and in-your-face, but it still felt like something was missing in the action-department at the end. I don’t know what it was, but something could have been a lot crazier about this material I feel like.